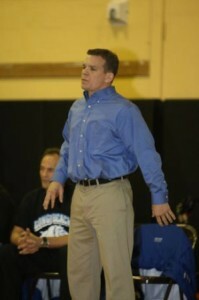 In the opposing corner was Wantagh co-head coach and former Long Beach head coach, Paul Gillespie. Gillespie recruited Ray Adams to Long Beach in 1996 and schooled him in the culture of the community and the methods of building champions. Coaching in the shadows of Nassau County’s legendary hall of fame coach Adams found the responsibility daunting. Who wouldn’t? The comparisons and expectations came with the responsibility like the weight of every Jets quarterback to follow Joe Namath. While having head coach responsibilities for 12 years, a section title proved elusive. They came close in 2004 when they held the lead after the semifinal round, but the MacArthur Generals wrestled back strong surpassing the Marines with 7 All-County wrestlers to their 6. This was his year, so he thought. Of course, in the duo of Gillespie and James Murphy, co-head coaches, they had other designs. Looking to defend their Section VIII and New York State tournament championship titles, their team was battle hardened and ready to take on all challengers. They feared no one and wrestled with earned confidence. However confident was Adams and his team, they had to know the price of victory would come with bumps and bruises. When the evening was over, the Marines departed quietly into the night after suffering a crushing 48 to 14 defeat. There were few glimmers of hope as many of Long Beach’s studs including Raghanahdan, Tigre-Borja, and Khoury suffered defeat. “I thought we could win … For whatever reason they beat the hell out of us that night,” said Adams. Adams wasn’t about to let one loss stand in the way of fulfilling his team’s potential. Since he began wrestling in the 5th grade, he understood the ups and downs of the sport. Like most wrestling competitors, elusive goals fed the appetite. Adams wrestled for Baldwin’s legendary coach Steve Shippos in High School where he was 2-times All Section VIII falling short of his goals when he lost an 8-4 decision to Rino Dimaria of Herricks in the ‘88 section finals. With the fire still burning in his heart, Adams wrestled for the University of Albany under coaches Joe Demeo and Andy Seras. There, he drilled at the Adirondack Three-style Wrestling Association while the US Greco-Roman team trained for the 1988 Olympic Games at Seoul Korea. Seras was an Olympic Team Member that year. Adams completed his collegiate career earning 2-times academic All-American, 2-times All-Conference, and 1-time All-State honors. Still, there was more to do. He returned back to his alma-mater to become Steve Shippo’s assistant coach from ’93-’96. When he heard Long Beach had an opening for a Social Studies teacher and an assistant coach to Damian Garcia, he jumped at the opportunity. Gillespie planned to retire in 1996, and he was recruiting his successors. Upon Gillespie’s retirement, Damian Garcia became the head coach, but in 1998, when Garcia landed a teaching job at Island Trees, Adams seized upon the opportunity to lead the team. Last year when I was invited to the end of the year social and awards night held for the wrestling team, I watched the kids interact with Ray Adams and observed from the outside, a little older and a little wiser. For me the highlight of the night was when the seniors got up to the microphone and spoke about their wrestling experience. One after the other spoke of Coach Adams. They used words like friend, family, and father. That’s when I realized what those kids had; that’s when I realized what I had when I was in the program. I got goose bumps as it all came together. He took over a program with the highest of expectations and certainly the highest work load, mostly due to me. He did it well and continues to do it well and I think he’s only getting started.” – Jon Masa, Long Beach Alumni, Hofstra Graduate and 3-times NCAA All-American. He’d been working hard and long attempting to replicate coach Gillespie’s success. Whether you were in Suffolk, Nassau, or upstate in Binghamton, you could find Adams and a bunch of Marines attending off season tournaments. While unable to replicate Gillespie’s success, his teams placed in the top 5 of section VIII 7 out of 11 seasons: two 2nds, two 3rds, two 4ths, and one 5th place finishes. They had some great dual meet accomplishments too. In 2004, they defeated the Generals in the league championship match, the first team to do so in 5 years. Team leader Dylan Palacio commented on the loss, “I think that, in my eyes, I was glad we lost. We had the talent, we had the heart, but there was a certain swagger that we had. A lot of us were just expecting an all county place. Up until that point we thought it was guaranteed, and we all learned a lesson that day.” The loss fed the appetite. On morning of Friday February 12th at Hofstra University, the moment had come. Would they overcome the setbacks along the way? Could they overcome the Warrior juggernaut? Could they overcome the Massapequa Chiefs’ onslaught of 21 qualifying wrestlers, a team who two weeks earlier defeated them by the score of 32-21 in the Section VIII Dual Meet Championship? And for a team who prided themselves in having a stronger tournament team than dual, the Marines fell behind the Chiefs taking 5th place at the Massapequa Holiday tournament by the score of 160.5 to 127 on December 29th. Past performance didn’t point in the right direction. Adams’ confidence never wavered. On day two, the Marines burst into the semifinal round tying the Syosset Braves with seven semifinalists and one ahead of the Warriors, followed by the Chiefs with five. The Warriors held a slim lead, just ahead of the Uniondale Knights and the Marines, who held the third spot. With a great performance in the semifinal round, they could move into the lead. These bouts weren’t in their favor. Five of them faced off against wrestlers having higher seeds. Their two number one seeds Mark Raghunandan and Dylan Placio breezed through the semifinals by the respective scores of 14-3 and 13-0, both against solid 4th seeded opponents. The first of the underdogs was Krishna Sewkumar. He banged heads against the number 2 seed, Robert Person of BJFK. Many expected Person to win the 96lb weight class. 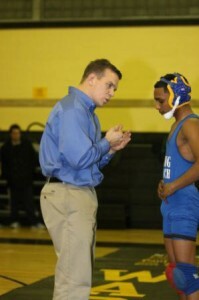 Wrestling many matches at 103lbs, Person built an impressive resume with wins over eventual 103lbs All-County wrestlers. Easily a title contender at 103lbs, Person would be a force at 96lbs. Trailing in the third period 2-1, Sewkumar pulled a reversal late in the third period to take the 3-2 lead. Sewkumar rode him with the boot with 24 seconds left while Person, like a Bronco just out of gate, worked to shake him loose. Sewkumar holds on for the upset victory. That made it an all Long Beach 96lsbs final. At 112lbs was Oral Allen, the fourth seed. He’d have to climb over the returning 2009 Section Champion and first seed, Will Montgomery. Montgomery proved too much to handle and soundly defeated Allen 10-3. At 130lbs, Edisson Tigre-Borja, fourth seed, faced off against number one seed Vincent Andriotti of Farmingdale. Andriotti held his opponents scoreless leading up to the semifinals, outscoring his opponents 21-0. Tigre surmounted the challenge defeating Andriotti by the convincing score of 14-6, making it 3 finalists for Long Beach. Next up was Nick Khoury at 135lbs. He was up against a Seaford opponent with a hot hand. In the quarterfinals, Ryan Harding knocked off the 2nd seed Dom Aspesi of Bethpage by fall at 3:34. Coming off a challenging quarterfinal where he defeated Tom Malinowski of MacArthur by OT decision 8-6, this semifinal bout could easily go either way. Khoury proceeded to dominate quickly, scoring the first takedown and three near fall points. After six full minutes of explosiveness, Khoury defeated Harding by a convincing 8-4 decision. That made four finalists for the Marines. Last up was Adam D’Auguste at 145lbs, another Long Beach fourth seed opposing the number one seed. At the center of the circle, he shook hands with Mac Maldarelli of Calhoun, the returning 2009 silver medalist at the weight. It was his tournament to lose. D’Auguste wrestled many matches at 152. Earlier in the season he lost a 4-2 decision to the eventual 152lbs gold medalist, James Ondris of Massapequa. Maldarelli controlled the match from the opening whistle, and when the last second expired, D’Auguste lost by Major Decision, 11-3. When the semifinal round completed, the Marines advanced five wrestlers into the finals, Wantagh four, and Syosset three. The Marines led the team scores with 186.5 points, Wantagh 160, and Syosset 146.5. The stellar performance pushed the Marines within reach of their title aspirations, and when the consolation finals completed, the Marines cemented their section title, even if every finalist lost. In total, the Marines earned nine all-county honors, followed by Syosset, Uniondale, and Wantagh who were tied with eight, and not far behind was Massapequa with seven. The final team standings were Long Beach 207.5, Wantagh 187, and Syosset 170.5. After 12 arduous years, the dream was realized. 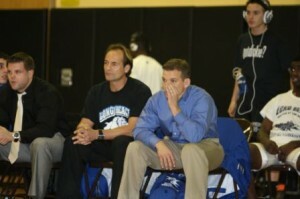 “I was so happy for the kids, coaches, alumni, and the Long Beach Wrestling Family,” said Adams of their accomplishment. With the dawn of the 2010-11 season upon us, the Long Beach, Marines come back even stronger. They return more section place winners than any other team in the section with eight. Seven of them placed in the top 3 of the section. Massapequa comes closest, returning 5 place winners, while both Wantagh and Plainedge return 4 apiece. Unlike many championship teams, the Marines return all but one of their All-Section wrestlers. On the strength of seniors Edisson Tigre-Borja (Section 2nd), Nick Khoury(Section 2nd), Adam D’Auguste(Section 3rd) and juniors Mark Raghunandan(Section 1st and 3rd State), Krishna Sewkumar(Section 2nd), Matt Gray (Section 3rd), Oral Allen(Section 4th), Dylan Placio (Section 2nd and 4th state), Joshua Lopez, Joe Bosco and Sophomore Steven Sewkumar expectations run high for an even better performance in 2010-11. Consequently, the Marines ranked first in the LHW Tournament ranking but fell behind Massapequa in the dual meet ranking on the strength of Massapequa’s greater number of returning qualifying place winners with 17 to the Marine’s 11. And on January 8th and 9th in typical Marine fashion, the Marines plan to storm the halls of Union-Endicott and announce their presence to the state. “If you want to be the best you have to let it roll. There will be some of the top teams in the state there. We want to go and compete against them, take a shot at winning that tournament,” said Adams. The competition at the UE-Duals this season will be fierce. Competing is John Glenn, last season’s champion; Chenango Forks, off a fifth place state tournament finish with many returning all-state athletes; Spencerport, always a strong team; Shenendehowa, missing last year but also with many returning all-state studs; and many top Section XI rivals including Brentwood, Sayville, and Sachem East. They may be the underdogs; they may be surrounded by the fiercest competitors in the state, but if any one of them happen to cross their path in January don’t expect them to leave the circle without a fight. They are the MARINES.